This DVD introduces you to the best birdwatching sites in Morocco from Taroudannt to Merzouga and gives you a real ‘feel’ for what it’s like to go birding there. The best sites - covers no fewer than 17 birding sites including specific locations for species such as Scrub Warbler, Desert Sparrow, Mourning Wheatear, Saharan Olivaceous Warbler, Egyptian Nightjar, Crowned Sandgrouse and Pharaoh Eagle Owl. The best birds - sit back and enjoy footage of almost 50 species, including many of the specialities, all filmed using high-definition digital video cameras. Travel into the deserts of Morocco with birdwatcher Dave Gosney as he shows you exactly how to find many of the most sought-after species. Watch footage of the birds themselves and listen as Dave explains how to recognise them by their songs and calls. There’s particularly helpful coverage of how to separate Thekla and Crested Larks and Saharan and Western Olivaceous Warblers. 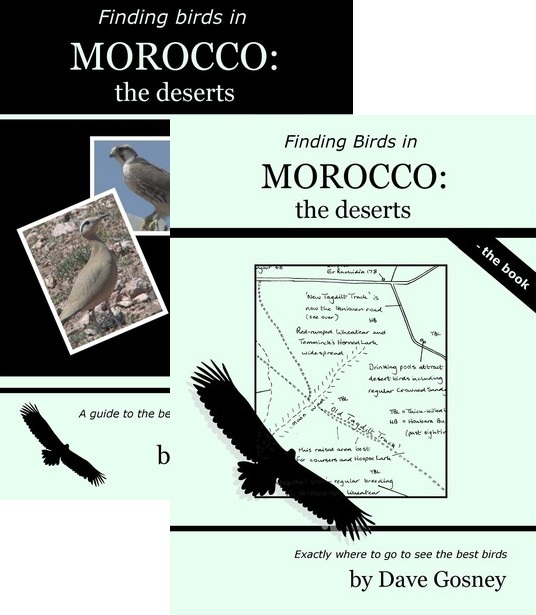 This is the book that gives you the latest information on where to find birds such as Egyptian Nightjar, Desert Warbler, Scrub Warbler, Fulvous Babbler and many more in much more detail than you can find anywhere else. You really shouldn’t go to the deserts of Morocco without it. 'On 15th April 2009, I was birding at Oukaimeden in Morocco’s Atlas mountains when I met up with Dominic Mitchell and a group of friends who had just arrived in the country and were about to visit the desert areas. Since I’d just been to the places they were aiming for, I was able to give them up-to-date directions and sketch maps for exactly where to find species such as Scrub Warbler, Egyptian Nightjar, Saharan Olivaceous Warbler, Desert Sparrow, Dupont’s Lark, Mourning Wheatear and Crowned Sandgrouse. Dominic later got in touch to say that my advice had been spot-on and that they’d managed to find all the species they’d wanted to see. The aim of this book is to give you that very same advantage for your next trip to Morocco'.